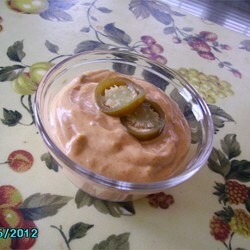 This is a delicious creamy jalapeno spread to use on quesadillas, tacos, or whatever you want. It tastes just like the one on Taco Bell’s quesadillas. In a blender or food processor, mix together the mayonnaise, diced jalapenos, jalapeno juice, cumin, sugar, paprika, cayenne pepper, and garlic powder. Blend until smooth and jalapeno is completely pureed, about 1 minute. Season to taste with salt, as needed.